Application and Server Monitoring Templates can now include attachment files. There’s now an option to mark template’s Match monitor “for network discovery only”. Now an icon can be assigned to a host or a host group. 'Script or Program' and 'Python' monitors now require less resources to run. free server monitoring, free monitoring software, free monitoring tool, distributed monitoring, SNMP, WMI, mail server, database server, network resources monitoring, PING, HTTP, HTTPS, Oracle, MySQL, ODBC, FTP Free network and server monitoring tool for Uptime/Downtime Monitoring of servers, web/intranet sites/applications, and network hardware via SNMP, WMI, HTTPS, FTP, ODBC, IMAP and more. 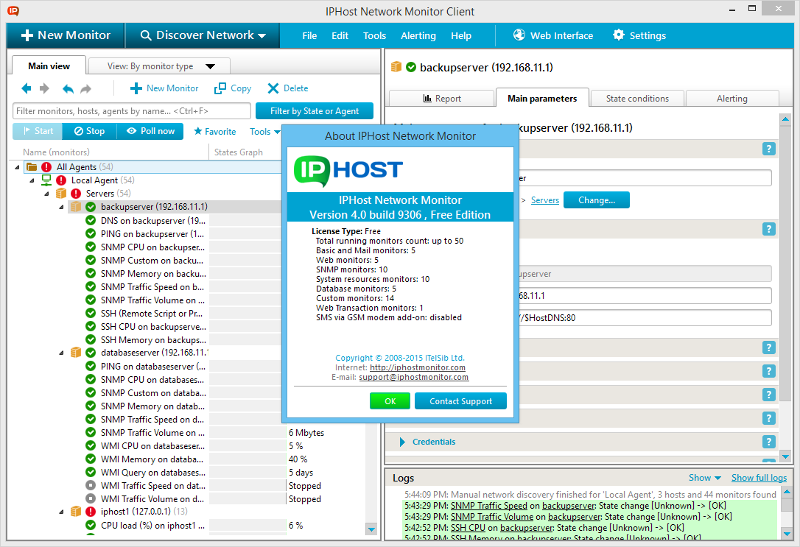 The free version allows you to run up to 50 network monitors.